I’ve been hearing a lot about psilocybin, but I’m honestly not sure what it does? The active ingredient in “magic mushrooms” is psilocybin. This is a non-toxic element. Though you may have heard that your reaction to mushrooms is a form of poisoning, much like alcohol, this is simply not true. This chemical interacts with your serotonin system to produce the psychedelic effect. In fact, psilocybin is one of the least toxic substances you can ingest that will change your consciousness. 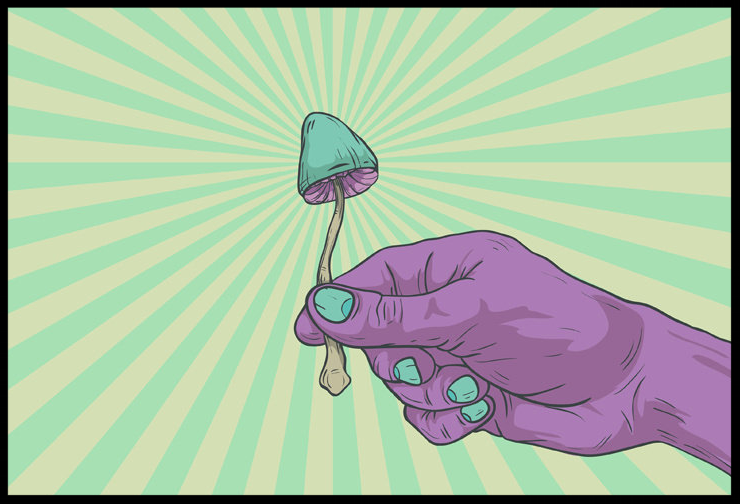 It has been shown over and over that psilocybin promotes neurogenesis, the growth of new brain cells and can repair physiological damage to the brain. We are lucky to be living in a time where the healing effects of psychedelics are finally allowed to be properly studied. Scientists from Imperial College London concluded that giving managed doses of psilocybin to subjects who were previously resistant to treatment by common anti-depressants led to “enduring reductions in symptom severity”. As is commonly known, much of depression stems from living in the past and much of anxiety stems from living in the future. Psilocybin mushrooms help us to become fully present. We're able to observe the world and ourselves exactly as they are at this moment. The result is usually a more care-free and open attitude toward our lives. We can stop for a moment to learn gratitude for our many blessings. There are a few serious mental issues that need to be disclosed before taking psilocybin. Those with a history of schizophrenia, suicidal behavior and some other mental states are advised against psychedelics use without a specific recommendation from their medical doctor. However, physical risk with psilocybin is extremely low. Please be honest in your application so that we can have full knowledge to let you know if our retreats are the right medicine for your healing. We can answer these specific questions in a private email. This is an interesting question because age/height/weight seem to have almost no effect on proper dosing of psilocybin. Since potency of psilocybin mushrooms can vary widely from each batch, it is best to dry, mix and encapsulate them in order to make equal doses. Our leaders are always testing and dosing our mushrooms to be sure of their strength. Psilocybe mexicana is very strong. For the first ceremony, we will be dosing about 1.5-3 grams per person. We will counsel with guests to see where they'd like to be after that. Most likely, people tend to go up to 3-7 grams the following nights. Luckily with psilocybin, there is not much nausea other than possibly 10-20 minutes towards the beginning and even high doses are very safe with the right facilitators. There are too many studies and scientific findings to list here. Please visit our Psychedelic Research page. All of the studies basically have the same conclusion: Psilocybin is safe and highly effective when taken correctly and with proper safety.